The short answer is that we are, or were on a Saturday afternoon in mid-October. During the work week, lunch is usually over in blink of an eye. With no time to relax and enjoy, lunch is a nourishment interval, necessary but often not fully appreciated. 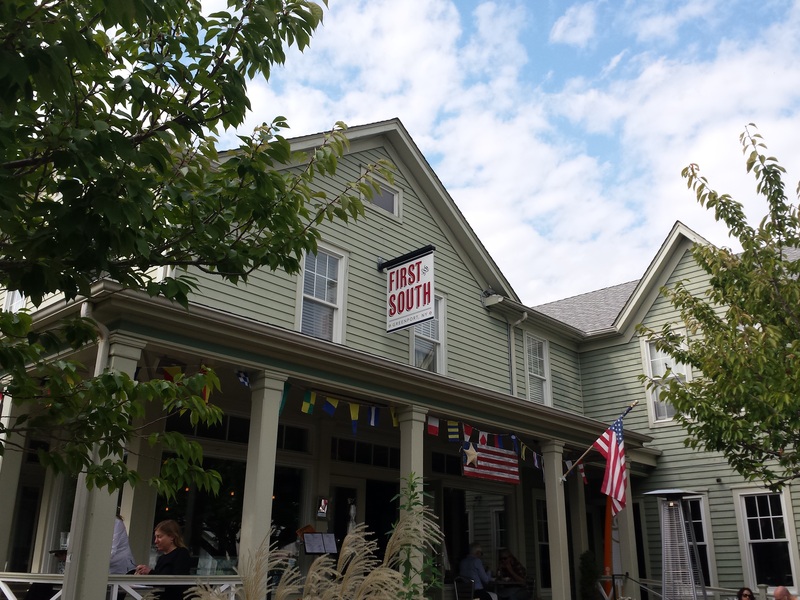 Not this time, as we sat down to a Saturday afternoon lunch in Greenport, on the deck at First and South. At last year’s Shellebration, which will be coming around again next month, I enjoyed the South Street Chowder, full of apple-wood smoked bacon, smoked cod, clams, and potatoes. Not surprisingly, lunch was delicious. Thinking light, Marian and I ordered a couple of salads, and wine by the glass. You can see my shaved raw carrot and tiny kale salad on the left. Dressed with cumin oil and spiced honey, the salad is a flavor explosion. Be sure you like cumin, because the chef certainly does. I added a chicken breast for some protein. It was cooked to order, moist and juicy. Marian went with the Caesar salad, pictured right, dressed with shaved Pecorino and white anchovies. Don’t like anchovies? These were deliciously refreshing and full of salty flavor. Taste one, and you might just change your mind about anchovies. 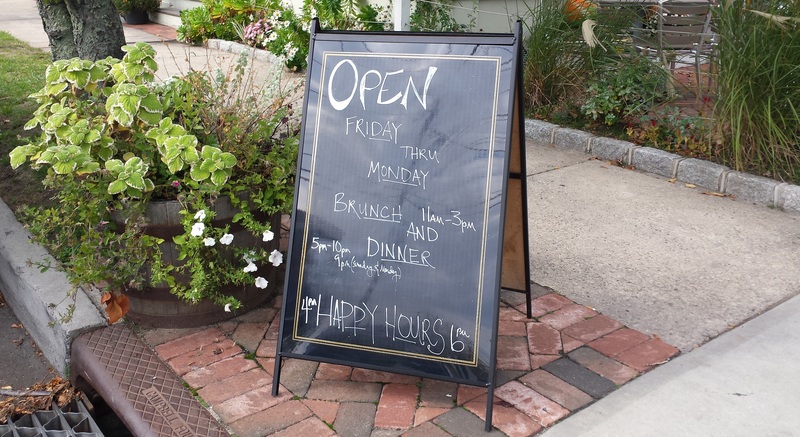 Greenport is a cute village, perfect for a postprandial stroll. We visited some old favorite shops like Kessie and Dreaming Buddha, finally arriving at Aldo’s for some of their fresh-roasted coffee. This is not coffee for the faint of heart. Delicious, rich, with a wine-like quality, it needs no accompaniment. Sensitive to caffeine? Be sure to order the decaf. 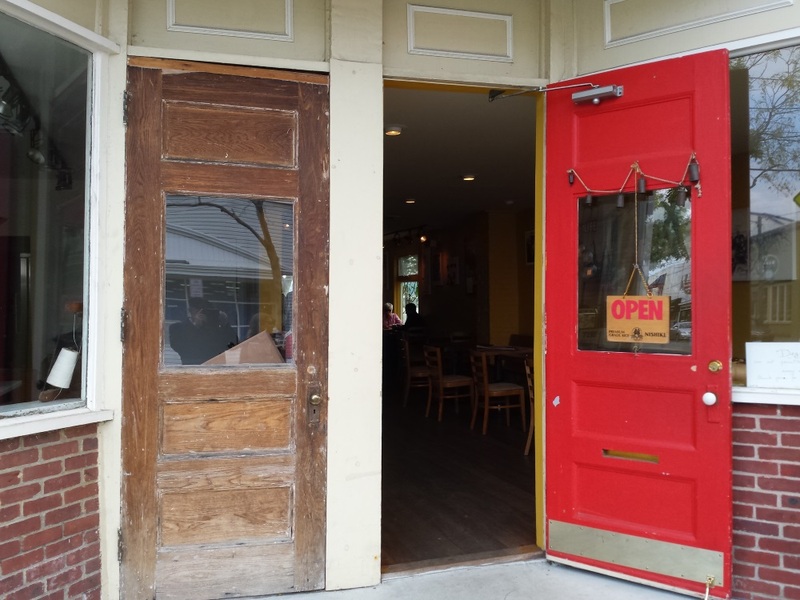 As pictured, the red door to Aldo’s is on Main St., and the back of the shop opens onto a deck, where you can sip, nosh, and enjoy the great outdoors. Today is “Taste of North Fork” and we are heading out, ready to see what the North Fork has to offer. No doubt, there will be wines to taste, food truck offerings to sample, beer on tap, and folks having fun. Meanwhile, enjoy your trip around town.